Swannington is a small parish and village situated in the Broadland Local Government District. The parish has an area of 587 hectares, and is some 13.5km to the northwest of Norwich City. The name ‘Swannington’ is thought to derived from a combination of Old Norse and Old English words for enclosure of Svveinn’s people. The earliest monuments in the parish are a round barrow situated on Alderford Common (NHER 7705), which along with a number of other possible barrows (NHER 5006) and some earthworks (NHER 5005) are of unknown, though probably prehistoric, origin. In addition a large number of Neolithic objects have been recovered, including polished axeheads (NHER 7708, NHER 33085), flaked axeheads (NHER 7706, NHER 7710, NHER 21010) and a plano-convex knife and sickle (NHER 7709). Although no Roman period monuments are known, a small number of objects have been recorded. These include pottery sherds (NHER 7713, NHER 7714), a possible copper alloy torc (NHER 7712), coins (NHER 35820) and fittings (NHER 7455). Roman pottery sherds have also been recovered from an area thought to contain an Early Saxon cemetery (NHER 7438), from which a number of brooches, sleeve clasps and a spearhead have been retrieved. No other monuments from the Saxon period have been recorded, but finds comprise a number of Early Saxon brooches (NHER 7455), a Late Saxon copper alloy comb (NHER 7465), and two Late Saxon Borre-style disc brooches (NHER 42549). The parish is also mentioned in the Domesday Book, although it does not seem to be exceptionally wealthy or populous. The earliest medieval monument is the church of St Margaret (NHER 7742), which has an early nave with north and south aisles dating to around 1300 and a perpendicular style tower. Inside there is also a fine decorated style sedilia and piscina, and a 13th century octagonal arcaded Purbeck marble font. Also possibly dating to the late medieval period is Swannington Hall (NHER 7739), a complicated building set within a large medieval moated site. The hall is thought to have been the house of the Richers family, and a number of linear features relating to a medieval garden or kitchen garden have been excavated. Also of possible medieval date are a moated enclosure and toft boundaries (NER 29484) visible just east of the village. A number of objects from the medieval period have been recovered, and these include pottery sherds (NHER 13980, NHER 29485) and objects such as fragments of a medieval colander (NHER 7455), fittings (NHER 42549) buckles (NHER 7465) horse harness pendants (NHER 35820, NHER 38038) and a seal matrix (NHER 49097). 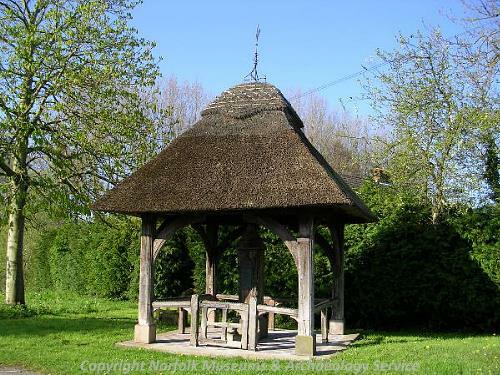 There are also a number of post medieval buildings of interest, including the Swannington village pump (NHER 10496), a cast-iron pump sheltered under a thatched roof supported on four columns and dating to 1888. Also of interest are The Lodge (NER 10497), a 17th century building with 19th century cast-iron gates and railings, as well as Swannington Manor (NHER 10547), a house thought to date to around 1700 and containing many fragments of stained glass, and Swannington Manor Farm (NHER 21866), a farmhouse built within the shell of a larger and older country house of around 1600. From more recent history, it should be noted that a section of what was once the Midland and Great Northern Joint Railway (NHER 13584) crosses the bottom of the parish. The parish was also the site of a World War Two airfield (NHER 7465), which was home to Mosquito and Spitfire squadrons.